11-13 Scion tC Projector Headlights w/ LED DRL Light Bar and Smoke Housing. Spec D Scion tC2 Headlights PN 2LHP-TC11G-TM are finally available. Available in Black, Chrome or Smoke. Fits 11-13 Scion tC. 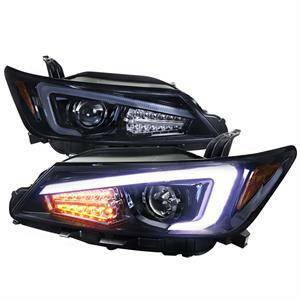 Finally, a premium set of Aftermarket Headlights for the gen 2 Scion tC (11-13). Available in Black, Chrome or Smoke, these Scion tC2 Headlights feature LED Light Bar and Projector.